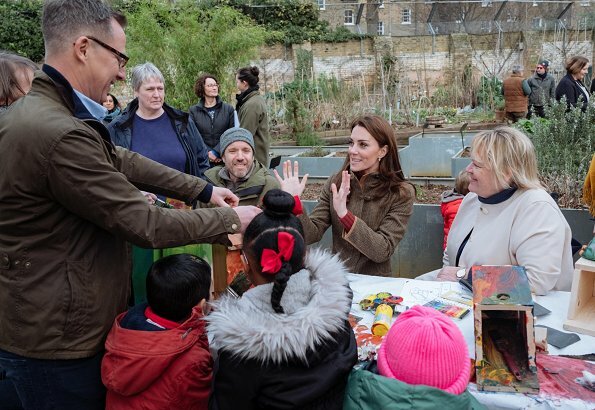 On January 15, 2019, The Duchess of Cambridge visited the King Henry’s Walk Garden in Islington to see how the project brings people together through gardening and food growing. 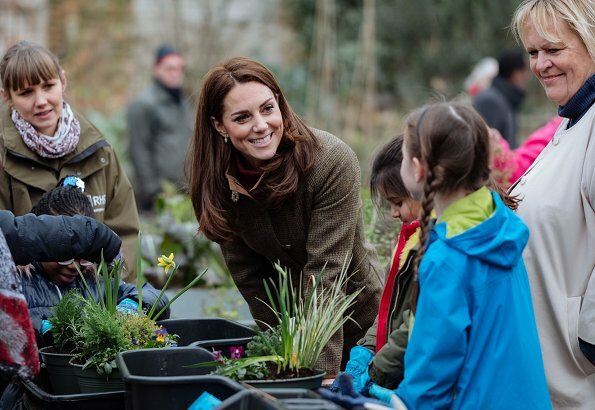 King Henry’s Walk Garden is an award-winning green space in the Mildmay ward of Islington, created by the local community, for the local community. 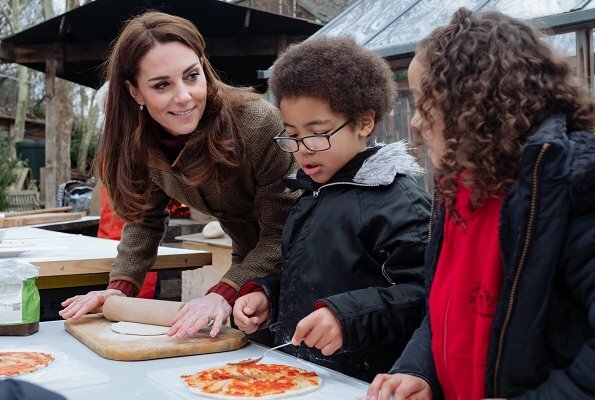 The Duchess then took part in a winter planting workshop, bird box building and pizza making in the garden’s kitchen area. 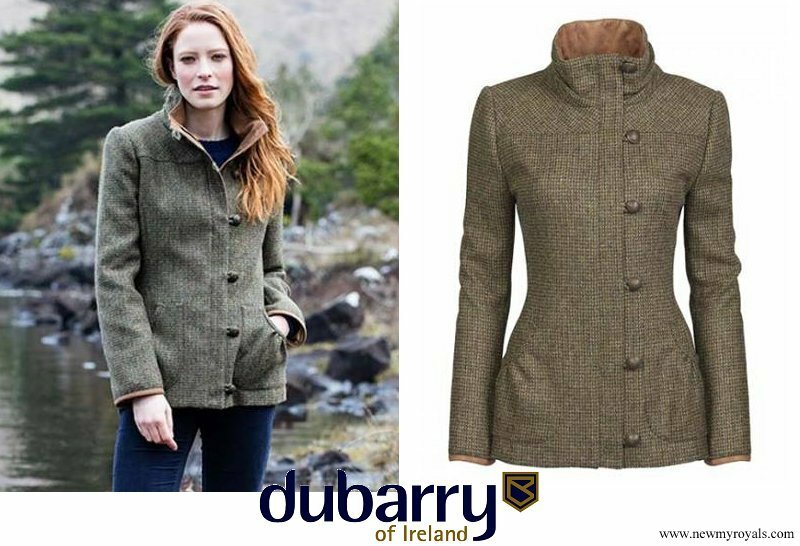 (The Duchess wore a tweed jacket by Dubarry). I really like this outfit, I love all the natural shades of green and brown and her rust colored sweater. I just don’t like the ankles boots over the skinny jeans. Maybe if the cuff had been folded up or if she’d worn a higher boot like her zip up the side brown boots or some hunters or Wellington’s. But it’s a really appropriate outfit and loved her conversations with the kids about pizza. She really seems like such a nice, personable individual. The jacket is absolutely beautiful, and looks wonderful on Catherine! but (and this is not new but afaic needs to be said) the skintight pants/leggings are not appropriate. To be honest, there is very little difference between these and what in the States are known as pantyhose and in the U.K. are called tights. Even my husband said "It looks like she forgot to put her skirt on." 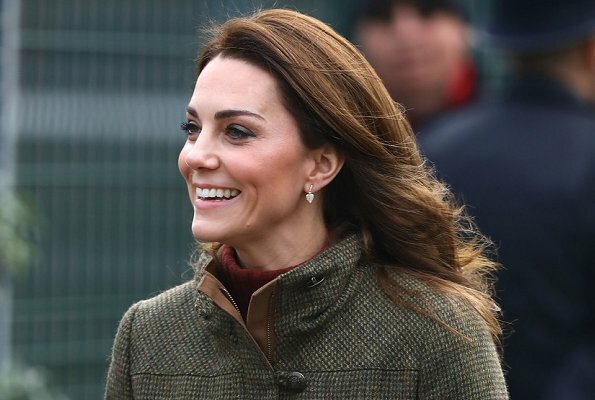 Catherine is a stunning and discerning woman who "gets it right" nearly every time; I hope she'll rise above this particular fashion trend soon. You are right, her pants look like tights. Those very skinny pants are not flattering on her. They look like leggings and leggings are just awful, Kardashian style. The tweed jacket is nice and has a great green color. It's wonderful to see her so relaxed. She is such a lovely woman! But I agree about the pants - too tight! Absolutely NO to the leggings... Jacket and boots love it!!! I really like this outfit, great jacket and killer boots, she looks so much more authentic to me when she is wearing younger , trendy styles. The skinny pants are here to stay maybe for another few years, it's just trends, and this one is only apt for young, thin women, I don't think it's inappropriate. Queens used to wear corsets and their waists were encased like sausages, not to mention the cleavages... please lighten up,people!! I love Kate, she’s such a natural and classy member of the RF. She looks fab, relaxed and like she really had fun there and felt very comfortable. I like her outfit, it's perfect for that occasion. Ce pantalon n'a rien élégant et je dirais même laid. I am neutral on the pants, but they are pants, hardly leggings, which would be utterly inappropriate. They are skinny pants, and they are a trend (one that you have to be very thin and fit--and young--to wear so I don't own any.) But technically let's call them what they are, since leggings are indeed just a thicker sort of tights and what she's wearing is definitely pants. Do not like when she wears those tights either. It is almost as if she was naked or in Long Johns. :-) Not appropriate. I can't wait until skinny jeans are a distant memory. Kate looks amazing! She is always at her best when she is dressed age appropriately. Too often she is dressed older than she is, that is, her mother could wear the same outfit she is wearing. The Dubarry jacket is perfection, and pairing it with skinny pants and combat boots keeps the look fresh and modern. (It is ignorance to call her PANTS anything else but pants just because you don't like them or wouldn't wear them yourself.) The colors are beautiful on her. 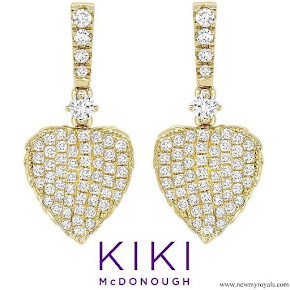 The one quibble I have is the earrings. 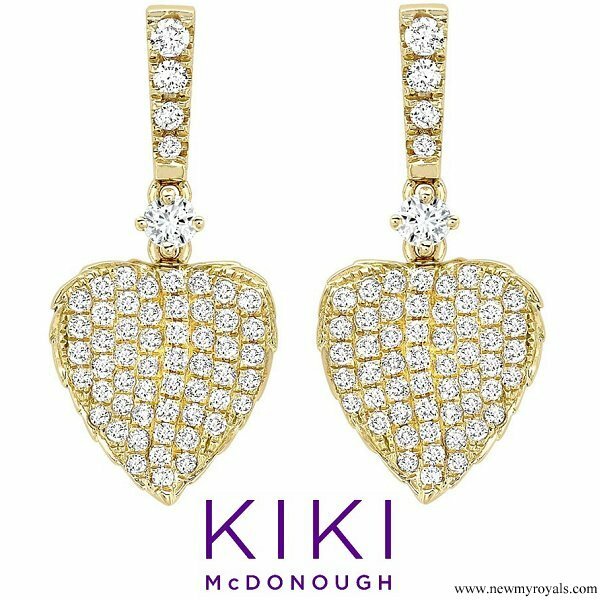 I think they are too much for the outfit and occasion. She looks great - really appropriate for this kind of fairly casual outdoor event but with enough "dressed up" touches to show she has made the effort.Love the earthy tones. As to her trousers they are very skinny and I think they're absolutely fine (she has the figure for them) but I disagree that they are leggings/tights - they look like a jean type fabric to me. Die broek is wel heel passend aan de benen maar niet dun, het is een winterbroek, ze is klaar om op jacht te gaan met die leuke vest. Passend gekleed voor de job. Give us a break! She is wearing skinny jeans like half the population on the planet. Perfect dressed for a casual event outdoor. 😂😂😂😂 you are right! I am wearing it right now. I think she looks great. Btw what else would you wear with combat boots? Boyfriend trousers or bootcut? I think none of them looks good with this kind of shoes. 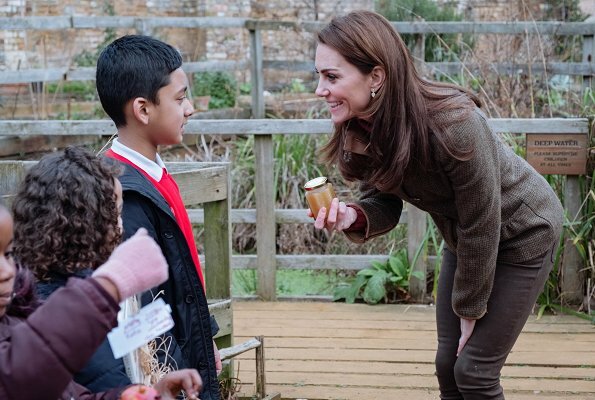 How old are the people commenting that Kate is wearing tights/leggings? Ridiculous. Skinny jeans are not going out of style anytime soon and have been called a wardrobe staple by basically every stylist and fashion magazine. Also the jeans tucked into the combat boots is very on trend and looks great. Casual Kate is one of the few time that she actually looks close to her age and not dressed bland like she usually does. For this to be a fashion blog, it seems like only about 25% of the comments actually know anything about the topic. Blair, I am around 50 and I frankly admit that I don't understand anything about fashion. As I work for the IT-industry I think that is fine. I can only say if I find an outfit beautiful or not so beautiful. It does not matter how old we are, it matters what we think about her clothes and we all have the right to do it. Please don't judge other having a different taste than you have. Not every trend is beautiful. Those skinny jeans are fine for teenagers, imo. Zucchina, not judging just legitimately wondering. I am in my 50s and would wear Kate's outfit. 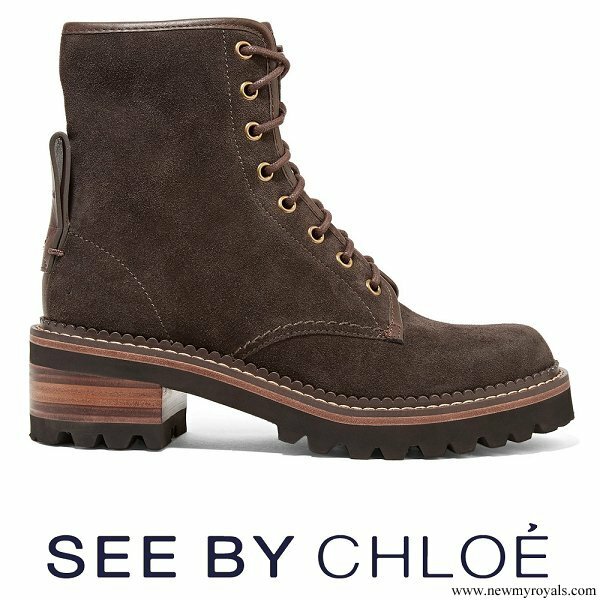 I wear skinny jeans, own combat boots and love this look. I also keep on top of fashion trends. If I did not have the figure for the pants, I would not wear them. Physical age does not determine what a person should and should not wear. What I do not do is dress too old or too young for my age. There are ways to adapt fashion to be age appropriate, and not every trend is worth wearing. I agree wholeheartedly with the comment from Blair. It seems like the majority of the people that post here don't know much about fashion, but state personal opinions, which is fine. We are all entitled to our opinions and like different things. More often than not, fashion editors disagree with opinions like the pants/leggings made here (or negative comments about Meghan's red/purple outfit), which demonstrates this point.